Courageous is made from a white material with black button eyes and an embroidered gold nose. He has red maple leaves on his ears and the soles of his feet and a red and blue ribbon tied around his neck. He has the words “Special Olympics, Olympiques Speciaux, Canada” embroidered on his chest in red and blue thread. Courageous was released on 31st December 2006. He was released for the 2006 Special Olympics in Canada. 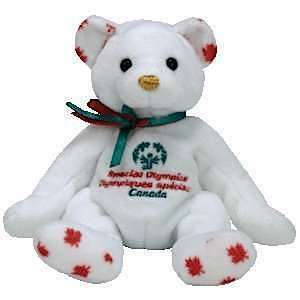 There are three bears that were released for the 2006 Special Olympics. Courageous who had a gold nose, Courageously who had a silver nose and Courageousness who had a bronze nose. All three bears have the same style number. Courageous retired on 27th December 2007.